Bukola Saraki, his entourage and members of the Peoples Democratic Party during his Bayelsa State visit. 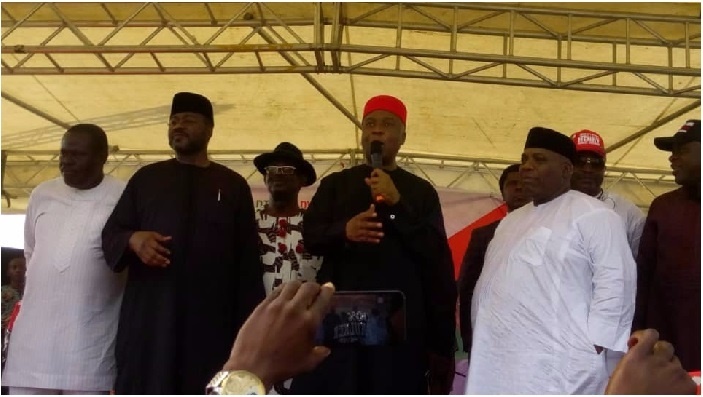 The Senate President, Dr. Bukola Saraki, visited Bayelsa on Thursday to push his presidential ambition and made some promises to the indigenes of the state. Adorned in white blouses, pink wrapper and head gear to match, Bayelsa state women trooped into 'Yenagoa Peace Park' located opposite the State Government House to welcome the President of the Nigerian Senate, Dr. Bukola Saraki. The crowd were seated by 10 :a.m, singing and dancing while awaiting the arrival of the number three man in Nigeria. Bayelsa State known for its daily heavy downpour, fortunately, experienced sun shine through-out the day. It was a dry day, so unusual in Bayelsa State that one will conclude that rain-makers were paid to stop the rain from falling. Or was it the presence of the man seeking the presidential ticket of the Peoples Democratic Party (PDP) that kept the rain away? By exactly 4:08 p.m. local time, the Senate President, accompanied by the state PDP Chairman, Mr Cleopas Moses, member representing Bayelsa East constituency at the National Assembly, Mr Ben Murray-Bruce, Speaker of the state House of Assembly, Dr. Konbowei Benson and other political office holders entered the venue. His arrival was heralded by shouts of welcome while the music and dance gained momentum. The women wriggled their back-side to the beat as others standing by cheered the Senate President. He was handsome and fresh, something that may have attracted most of them to the man that has promoted the #GrowNigeria idea. Addressing the gathering, Dr. Saraki apologised for being late and thanked Bayelsans for honouring him. "I have come to inform you of my intention to contest for the seat of the Presidency in 2019 general election. "We want a president that will ensure everyone is in control, not someone in the front while others will be at the back,” he said. He advised the people to choose a president who is young, vibrant, truthful and selfless. "A president that one will be proud to identify with." With the crowd cheering him on, he continued. "I want you to send a message to your delegates and tell them that in Abuja on October 6, it's only one man that have the ability, capacity and courage to deliver. "The man wey sabi the work and can work well is Abubakar Bukola Saraki. "As you have honoured me today, I too will honour you when I get to Aso Rock with your support," he promised. He assured Bayelsans that if elected President, he would ensure that whatever was their right would get to them. Dr. Saraki also promised to give them their rightful seat at the federal table. In his speech, the state PDP Chairman, Mr Cleopas Moses, welcomed the Senate President, telling Bayalsans that Dr. Saraki was the only man being persecuted by members of his own house. He said the prosecution commenced while he was still a member of the APC and expressed surprise as to how he had escaped the traps set for him and emerged victorious. "When you see a man that is under the covering of divinity, it is difficult to fight against that man. “We the PDP family, out of the 105 wards in Bayelsa state, are solidly behind you,” he assured the man from Kwara State. The State PDP chairman, however, told the Senate President that, as delegate means emissary, "you are speaking to your supporters who will come to Abuja with collective mind and make you proud". "The ljaw nation have been under deprivation for a long time. "Endeavour to keep your promises to us when you finally become President of Nigeria,” he demanded. He then prayed that evil calculations would not go near Dr. Saraki and that the Alright God would lead him safety home.